Independence Day Special: A Dramatic Reading of Howard Zinn’s A People’s History of the United States with James Earl Jones, Alfre Woodard, Kurt Vonnegut, Danny Glover, Harris Yulin and others | Democracy Now! Today is a national holiday commemorating July 4, when American colonies declared their independence from England in 1776. While many in the U.S. hang flags, attend parades and watch fireworks, Independence Day is not a cause of celebration for everyone. For Native Americans it is a bitter reminder of colonialism, which brought disease, genocide and the destruction of their culture and way of life. For African Americans, Independence Day did not extend to them. While white colonists were declaring their freedom from the crown, that liberation was not shared with millions of Africans who were captured, beaten, separated from their families and forced into slavery thousands of miles from home. Today we will go back more than 150 years to hear one of the most powerful voices of the abolition movement: Frederick Douglass. Born a slave in Maryland in 1818, Douglas escaped from slavery in the 1830s and became a leader in the growing abolition campaign through lectures and his anti-slavery newspaper, The North Star. He would become a major civil rights leader in the United States. 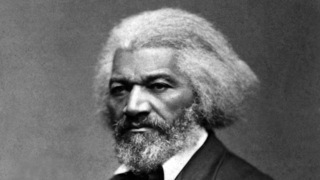 Douglass gave his Independence Day oration in 1852. Today we’ll hear excerpts of that speech as part of a dramatic reading of Howard Zinn’s classic work: A People’s History of the United States. The great historian gathered with actors and writers several months ago at the 92nd Street Y in New York. The cast included Alfre Woodard, Danny Glover, Marisa Tomei, Kurt Vonnegut, James Earl Jones and others. Howard Zinn, author, A People’s History of the United States. Jeff Zinn, Howard Zinn’s son. Alice Walker, author, novelist and essayist. AMY GOODMAN: Today is a national holiday commemorating July 4th, when American colonies declared their independence from England, 1776. While many in the U.S. hang flags, attend parades and watch fireworks, Independence Day is cause of celebration not for everyone. For Native Americans, it’s a bitter reminder of colonialism, which brought disease, genocide and the destruction of their culture and way of life. For African Americans, Independence Day did not extend to them. While white colonists were declaring their freedom from the crown, that liberation was not shared with millions of Africans captured, beaten, separated from their families and forced into slavery thousands of miles from home. Today, we will go back more than 150 years to hear one of the most powerful voices of the abolition movement, Frederick Douglass, born a slave in Maryland in 1818. Douglass escaped from slavery in the 1830s and became a leader in the growing campaign against slavery through lectures and his anti-slavery newspaper, The North Star. Douglass gave his Independence Day oration in 1852. He would become a major civil rights leader in the United States. Today we’ll hear excerpts of that speech as part of a dramatic reading of Howard Zinn’s classic work, A People’s History of the United States. The great historian gathered with actors and writers several months ago at the 92nd Street Y in New York. He gathered with Alice Walker, Alfre Woodard, Danny Glover, Kurt Vonnegut, James Earl Jones and others for that reading. We begin with James Earl Jones reading from Howard Zinn’s People’s History of the United States. HOWARD ZINN: [read by James Earl Jones] My viewpoint, in telling the history of the United States, is that we must not accept the memory of states as our own. Nations are not communities and never have been. The history of any country, presented as the history of a family, conceals a fierce conflict of interest. And in such a world of conflict, a world of victims and executioners, the job of thinking people, as Albert Camus suggested, is not to be on the side of the executioners. Thus, in that inevitable taking of sides which comes from selection and emphasis in history, I prefer to tell the story of the discovery of America from the viewpoint of the Arawaks, of the Constitution from the standpoint of the slaves, of the rise of industrialism as seen by the young women in the Lowell textile mills, the conquest of the Philippines as seen by black soldiers on Luzon, the postwar American empire as seen by peons in Latin America. And so on, to the limited extent that any one person, however he or she strains, can “see” history from the standpoint of others. My point is not to grieve for the victims and denounce the executioners. Those tears, that anger, cast into the past, deplete our moral energy for the present. And the lines are not always clear. In the long run, the oppressor is also a victim. In the short run, the victims, themselves desperate and tainted with the culture that oppresses them, turn on other victims. HOWARD ZINN: What is too often overlooked in the triumphal story of the growth of American industry in the nineteenth century is the human cost of that triumph: the lives cut short, the maimed bodies of the men and women who worked in the factories, the mills. In the Lowell, Massachusetts, textile mills of 1836, where girls went to work at the age of twelve and often died by the time they were twenty-five, one of the first strikes of mill girls took place. It is described by one of them, Harriet Hanson. AMY GOODMAN: Read by Myla Pitt. Back to Howard Zinn, in this Democracy Now! special. AMY GOODMAN: Danny Glover, reading Dr. Martin Luther King. Today, on this Independence Day special of Democracy Now!, a reading of excerpts of Howard Zinn’s A People’s History of the United States, with Alice Walker, Myla Pitt, Jeff Zinn, Howard’s son, Marisa Tomei, James Earl Jones, Danny Glover, Yulin Harris, Kurt Vonnegut and others, read at the 92nd Street Y.